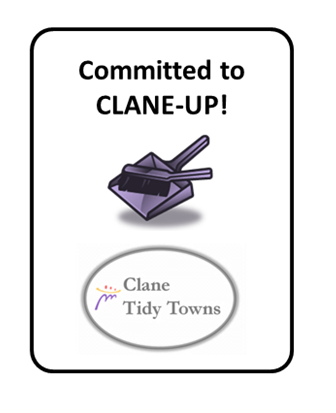 Clane Tidy Towns are delighted to announce the launch of their new “Committed to Clane-Up” initiative. Businesses and organisations that commit to cleaning up around their premises are provided with a “Committed to Clane-Up” sticker to display in their shop window. Clane Tidy Towns are delighted with the enthusiasm local businesses have already shown signing up to the scheme and salute them for playing their part in making Clane an even better place for locals and visitors alike. If your business or organisation would like to join the scheme please send an email to ClaneTidyTowns@gmail.com or drop down to the village green in front of the Abbey on Tuesday evenings at 7:30pm where the volunteers gather for the regular weekly cleanups. This entry was posted in Clane Community Council, Tidy Towns and tagged Clane, Committed to Clane Up, Tidy Towns on May 5, 2012 by jkennedy.